JW Marriott Essex House New York, the iconic hotel on Central Park South in Manhattan, announced the completion of a $38 million transformation of its 426 guest rooms, 101 suites, and corridors, dramatically redesigned to interpret a new and modern aesthetic. 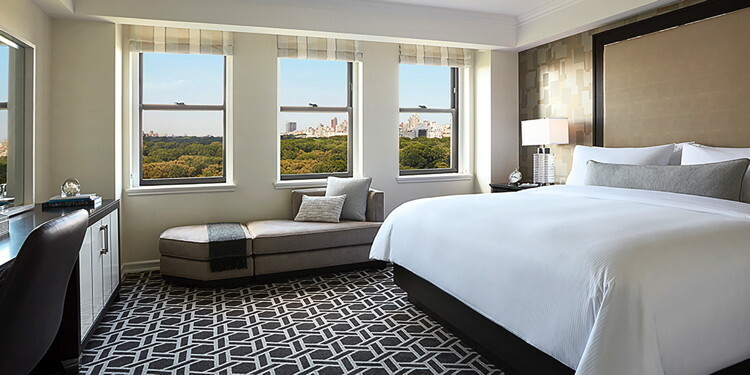 JW Marriott Essex House New York, the iconic hotel on Central Park South in Manhattan, announced the completion of a $38 million transformation of its 426 guest rooms, 101 suites, and corridors, dramatically redesigned to interpret a new and modern aesthetic. The hotel's structure and strong lines of its art déco heritage have been softened and expressed in a re-defined way. This is a design that celebrates the many decades of the Essex House, with a subtle nod to the 1930s period, when the hotel first opened its doors. The hotel's new design evokes a strong historical rooting but with a fresh twist. A bold but neutral color palette plays to fashion's own rebirth of the period. Carpet patterns are geometric , based on art déco but simplified in modern charcoal and cream colors. Furniture finishes are simple and clean in dark oak, white lacquer, polished chrome and bronze. The entire feeling of the new rooms is that of a personal pied-à-terre. Comfort accents include bedside acrylic lamps with a pop of glamour, along with embroidered pillows that capture the art déco motif into a decorative detail – creating a residential, at-home vibe. All of the hotel's bathrooms have been freshly updated with glossy black vanities and fittings, to complement the guest room design. "For over 80 years, guests have enjoyed the hotel's unique and beautiful architecture, warm luxury and personal service," says John Rieman, general manager. "Our newly designed guest rooms and suites reflect our long history on Central Park South, with a transformation to a fresh modern style." The hotel sits prominently on one of the world's most famous streets, with incomparable views of the park's lush greenery, lakes and historic stone bridges. From the central Sheep Meadow and The Lake to the north, all of Central Park unfolds from the park-facing guest room windows. Several suites boast private outdoor furnished terraces, where the view is even more dramatic, capturing the surrounding city from a bird's-eye perspective. The team of award-winning Wimberly Interiors, a design studio of WATG, with offices in New York City and around the world, was responsible for the overall interior design. Their distinctive projects include the JW Marriott Muscat, the St. Regis Dubai, and the Ritz – Carlton Tamuda Bay. 24-hour Fitness Center, and Southgate, an American restaurant and bar overlooking the park. It features 16 distinctive meeting rooms and executive boardrooms, a Beaux Arts-inspired Grand Salon (3,800 square feet) and an intimate Art Déco Suite for up to 125 guests. First opened in 1931 at this prestigious address, JW Marriott Essex House New York is a work of art in itself, with ornate art déco gilded doors and rich wood paneling in its public area, and a Beaux Arts Grand Salon that has hosted numerous dignitaries and celebrities over the yearsOn a history note, the hotel originally opened as the Sevilla Towers in 1931 in an area of three blocks of New York City once known as the Spanish Flats. Central Park, forming the hotel's front yard, was already more than 50 years old when the new hotel was built. Marriott International first managed the hotel from 1969-1984. It became the JW Marriott Essex House New York, the first JW Marriott brand hotel in New York City, in September 2012.